CampOUT! is a UBC-supported summer camp for British Columbia and Yukon’s queer, trans, and allied youth aged 14 to 21. 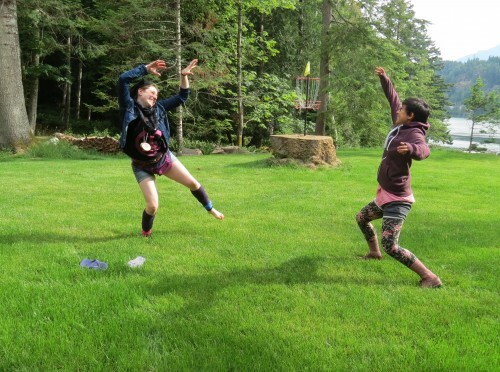 Running from July 2 to 5, 2015 on Gambier Island, the sixth annual CampOUT gives opportunities for youth to become leaders for social change, meet new friends, access resources, and engage in imaginative, critical, and innovative workshops. CampOUT also features traditional camp activities, such as canoeing, campfires, and arts and crafts. “I feel incredibly accepted and supported at camp, and that really helped me begin to accept myself,” one past participant shared after attending CampOUT. CampOUT is an opportunity for diverse range of individuals to come together to learn more about themselves and each other. It also enables participants to learn about how they can act as allies across their differences and share their skills, while getting their needs met. If you or your child is interested in a safe and inclusive space where you/they can develop leadership skills, build self-esteem, inspire each other, foster hope and resilience, and connect with resources that can support your/their health and well-being, give CampOUT a try. The camp only costs $25 thanks to the generosity of community partners and donors. Application for CampOUT! is open now until Sunday, March 29. You can find more information and apply on CampOUT’s website. Should you have any questions, please contact CampOUT at campout.director@ubc.ca, 604-822-8298, or toll free at 1-877-678-2267. This entry was posted in Events, Gender, Parents on Campus, Sexual Orientation, Student Leadership by HannahBarath. Bookmark the permalink.